The two were charged with 14 felony counts, including wire fraud, conspiracy to commit wire fraud, obtaining property under color of their official office and conspiring to the do the same. They were also charged with making false statements to a federal credit union. Additionally, Bob McDonnell is charged with making a false statement to a financial institution and Maureen McDonnell is charged with one count of obstruction of an official proceeding. Wow. Just wow. You can read the indictment for yourself here. Comments are rolling in. Here’s what I’ve received so far, in the order received. Today is a sad day for the Commonwealth of Virginia. If nothing else, this speaks to the urgent need for comprehensive ethics reform. We are very disappointed by the news today. 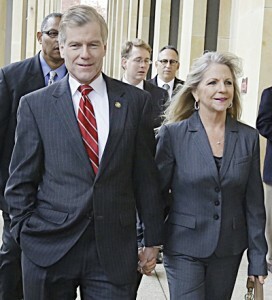 We have all known Bob McDonnell for a long time. He is a good friend whom we deeply respect. He has served his country and Commonwealth for nearly his entire adult life. We know that he has always strived to serve with the utmost conviction and integrity. Admittedly, he has made mistakes in judgment. He has apologized for those actions, which we know all Virginians deeply appreciate. We are a nation of laws. We believe in the rule of law and are confident in the ability of our legal system to render the rightful judgment, whatever it may be. That process must be allowed to run its course without interference or impediment. We are all praying for Governor McDonnell and his family during this difficult time. I am obviously troubled by the charges that federal prosecutors have made against Governor McDonnell and his wife Maureen and the message that this period in our history sends about how government in this Commonwealth is run. As this case progresses, it is my sincerest hope that justice will be served and that Virginians get the answers to which they are entitled. As Governor, I will remain focused on leading this Commonwealth in a way that restores Virginians’ trust in government and honors their expectation of transparency and accountability. I want to thank the many federal and state public safety officials who have worked on this case for their tireless and impartial efforts. Dorothy’s and my thoughts and prayers are with the entire McDonnell family. This is a sad day for Virginia, but I remain optimistic that we can work together to reform our system in order to prevent episodes like this from occurring ever again.